Tanzania’s John Magufuli – A New Type Of African Leader? Nigeria Warn Citizens Against Travelling To The U.S.
East African Federation: A New African Superpower? How To Escape Corporate Slavery & Debt! 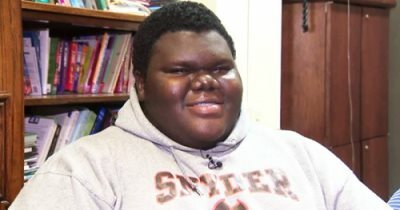 AFRICANGLOBE – Dylan Chidick, a 17-year old teenager from New Jersey who has had several challenges including homelessness, has recently been accepted to 17 colleges. He is determined to be the first in his family to go to college. “The dream I want to achieve, I have to have a lot of determination,” said Dylan, who moved to the US from Trinidad at the age of 7. Life has been tough for him and his family. His younger twin brothers both have serious heart illnesses and they have been in and out of homelessness. “My family went through a lot and there has been a lot of people saying, ‘you can’t do that,’ or ‘you’re not going to achieve this,’ and me — getting these acceptances — kind of verifies what I have been saying. I can do it and I will do it,” he said. He has already proven himself as the senior class president at Henry Snyder High School and a member of the honor society. Now, he wants to enter college to achieve his dreams for his family. His mother, Khadine Phillip, took courage to ask for help from the non-profit “Women Rising” and Dylan is more than grateful for it. “Making herself vulnerable and putting herself out there, that made me determined to never let us get back in that situation again,” Dylan said. “She is a great example in doing everything necessary to help her children,” Roseann Mazzeo, executive director for Women Rising, said. Moreover, all the costs for his college applications have been waived, considering his financial situation. Once he picked his preferred college, he said he wants to study political science. We are an organisation of people dedicated to the propagation and the dissemination of news and information relating to, and of importance to African Peoples worldwide. Our main objective is to provide an online portal where people of African decent; African heritage and friends of Africa can liaise and exchange knowledge and information. By accessing this website, you are agreeing to be bound by these Terms and Conditions of Use, all applicable laws and regulations, and agree that you are responsible for compliance with any applicable local laws. If you do not agree with any of these terms, you are prohibited from using or accessing this site. The materials contained in this website are protected by applicable copyright and trade mark law. This license shall automatically terminate if you violate any of these restrictions and may be terminated by AfricanGlobe.net at any time. Upon terminating your viewing of these materials or upon the termination of this license, you must destroy any downloaded materials in your possession whether in electronic or printed format. The materials on AfricanGlobe.net’s website are provided “as is”. AfricanGlobe.net makes no warranties, expressed or implied, and hereby disclaims and negates all other warranties, including without limitation, implied warranties or conditions of merchantability, fitness for a particular purpose, or non-infringement of intellectual property or other violation of rights. Further, AfricanGlobe.net does not warrant or make any representations concerning the accuracy, likely results, or reliability of the use of the materials on its Internet website or otherwise relating to such materials or on any sites linked to this site. In no event shall AfricanGlobe.net or its contributors be liable for any damages (including, without limitation, damages for loss of data or profit, or due to business interruption,) arising out of the use or inability to use the materials on AfricanGlobe.net’s Internet site, even if AfricanGlobe.net or a AfricanGlobe.net authorized representative has been notified orally or in writing of the possibility of such damage. Because some jurisdictions do not allow limitations on implied warranties, or limitations of liability for consequential or incidental damages, these limitations may not apply to you. The materials appearing on AfricanGlobe.net’s website could include technical, typographical, or photographic errors. AfricanGlobe.net does not warrant that any of the materials on its website are accurate, complete, or current. AfricanGlobe.net may make changes to the materials contained on its website at any time without notice. AfricanGlobe.net does not, however, make any commitment to update the materials. AfricanGlobe.net has not reviewed all of the sites linked to its Internet website and is not responsible for the contents of any such linked site. The inclusion of any link does not imply endorsement by AfricanGlobe.net of the site. Use of any such linked website is at the user’s own risk. Any claim relating to AfricanGlobe.net’s website shall be governed by the laws of the Republic of South Sudan without regard to its conflict of law provisions. Third party websites including advertisers on AfricanGlobe.net also may place a cookie on your computer and by visiting AfricanGlobe.net you agree to this. Advertisers may place a file called cookie on your personal computer and by visiting AfricanGlobe.net you give permission to that. All posts made on AfricanGlobe.net express the views and opinions of the author and not the webmaster, admin or any other member of AfricanGlobe.net. By visiting AfricanGlobe.net you specifically acknowledge and agree that AfricanGlobe.net is not liable for any defamatory, offensive or illegal conduct of any user. you to sign in, subscribe, enter your name or perform other actions to get access to the locked content. email address will be added to the subscription list for sending target news and special offers. You can unsubscribe at any time by clicking on the link at the end of any of emails received from us. permissions to read or perform some social actions. Content Locker never collects other data and never publish anything in social networks from your behalf without your permissions. After unlocking the content the Content Locker removes all the access tokens received from you and never uses them again.